HAMILTON - The Crown is expected to continue building its case in a Hamilton court today with testimony connecting the events that led to two men being charged with murder in the death of Tim Bosma. Bosma disappeared on the night of May 6, 2013 after taking two strangers on a test drive of a truck he was trying to sell and his body was found a week later burned beyond recognition. One of the lead investigators told a the jury on Wednesday that a tip from a Toronto man about one of the accused killer's tattoos gave police a major breakthrough in the case. Det. Greg Jackson says the man told police about a test drive linked to the same phone number involved in Bosma's disappearance, and mentioned that one of the men interested in his truck had the word "ambition" tattooed on his wrist. 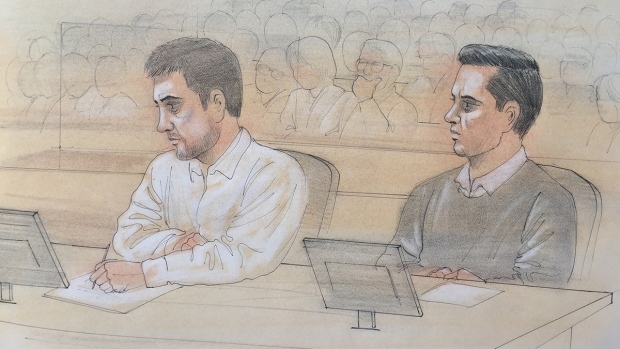 Dellen Millard, of Toronto, and Mark Smich, from Oakville, Ont., have both pleaded not guilty to first-degree murder in Bosma's death. Millard has a tattoo with the word "ambition" on his left wrist.